I'm a new member (so please be gentle) and have plucked up the courage to show you guys something I have been working on recently. Obviously I am a huge fan of Bladerunner, otherwise I wouldn't be here, but I have also been collecting and making models for nigh-on thirty years, mostly in the genres of film, sci-fi and fantasy. 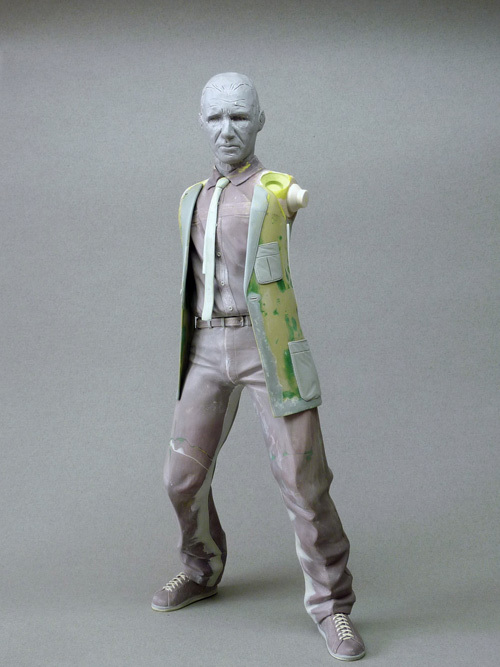 I have always been slightly frustrated by the lack of Bladerunner related model kits though. There are some excellent vehicle and hardware kits available but figures of characters have always been a little thin on the ground which is surprising given the great characters and costumes in the movie. 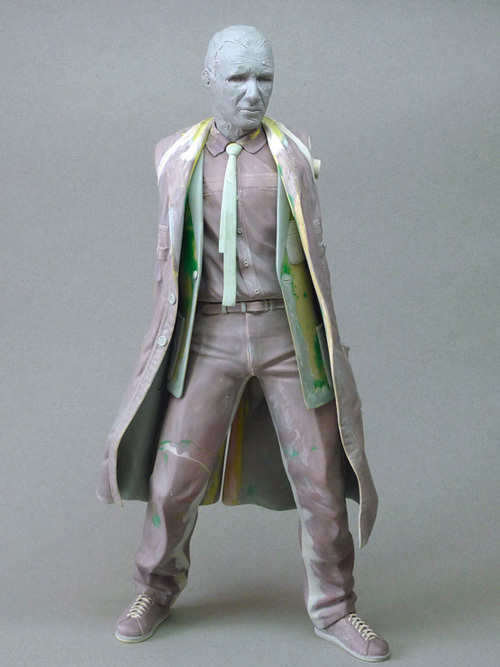 Inspired by some of the fabulous action figure customs and great model work from the very talented and thorough forum members here, I thought I would take the plunge and have a go at sculpting a figure for myself to try and fill the hole in my collections. 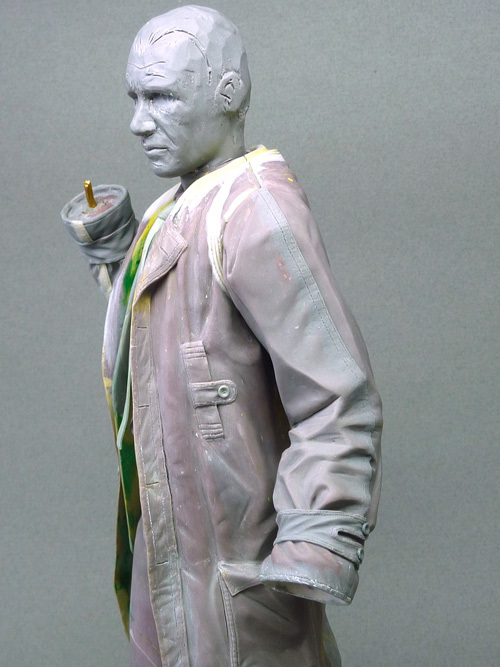 I have sculpted the figure at 1/6 scale using polymer clay and epoxy putties. 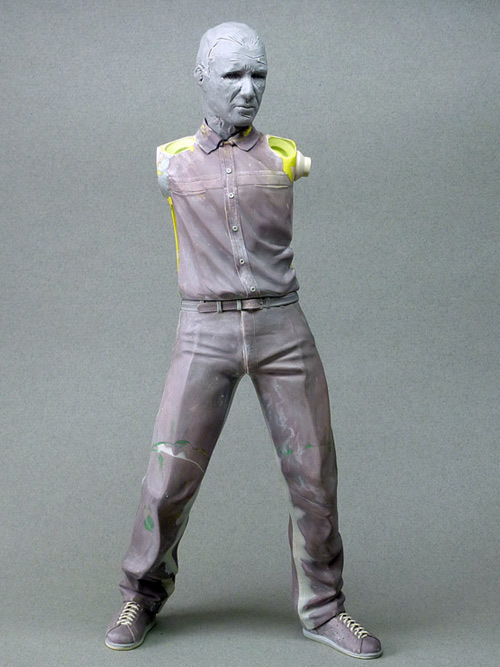 The head at the moment is something of a 'placeholder' just to give me a feel for the pose and proportions. 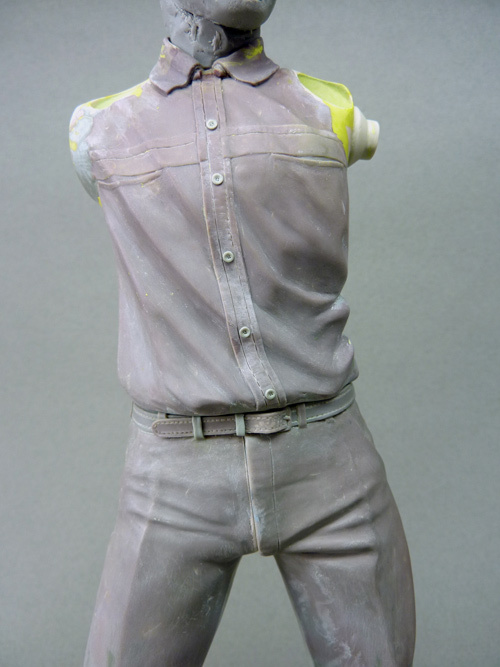 Keen eyes will notice that I have sculpted some locations for the arms and other parts. 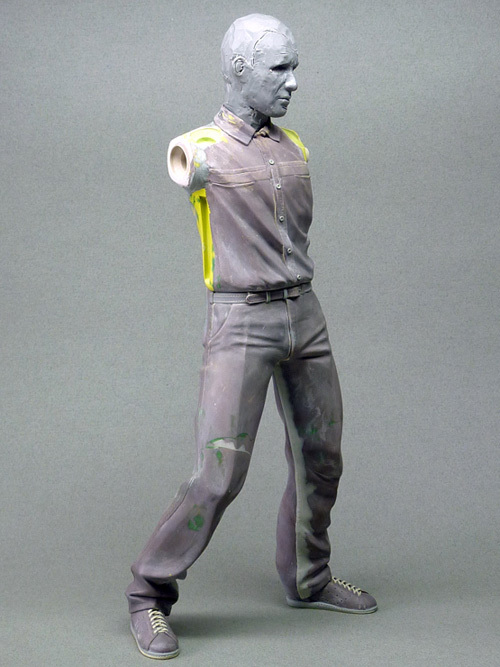 My intention is to create the figure in sub-assemblies as this will hopefully help when I eventually come to the painting and finishing of the figure. I make friends. They're toys. My friends are toys. I make them. It's a hobby. Welcome to Propsummit tinylight Very dynamic pose you got there. Love the folds of the different fabrics (shirt vs pants). 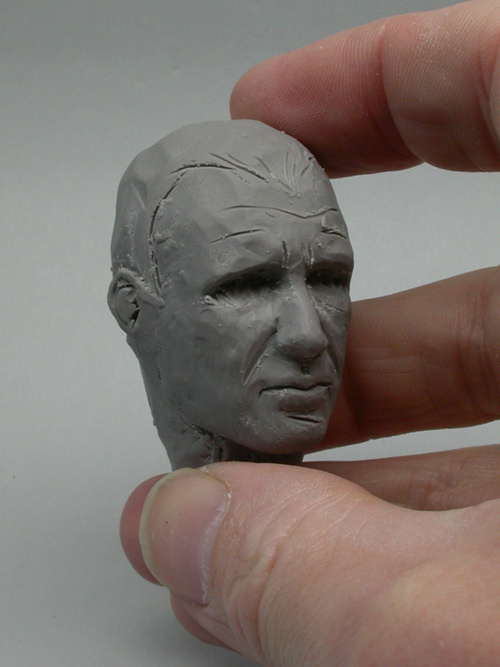 I see that the head/face is far from being done, but it has, already, the known features of Ford's face. Keep up the good work and waiting impatiently for your next update! Many thanks for the encouraging words joberg. I am intending to keep the pose fairly low-action but still retain a certain amount of gravity to it, I guess when the trench coat goes on the pose may become a little more subtle as the outlines will change. 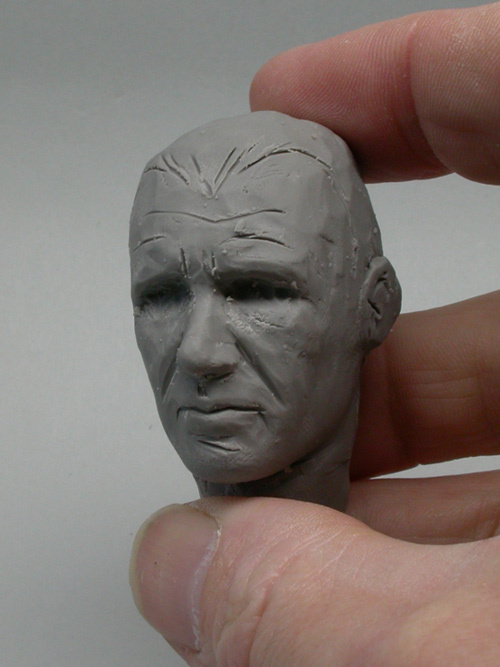 I must admit I am feeling pretty daunted at the prospect of sculpting a Ford likeness, so the 'placeholder' will probably be around until I've built up the courage to tackle it. 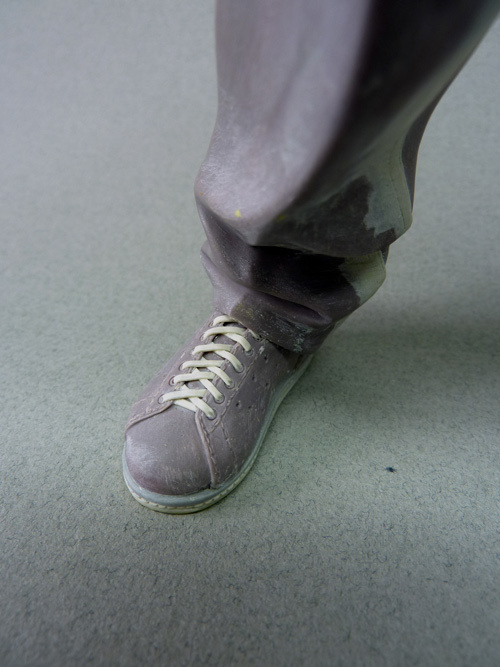 I'm currently sculpting some of the blazer and hope to show some progress soon but until then I have a couple of detail shot of the shirt and shoes. Hopefully the sculpted detail on the shirt will help me when it comes to painting in the complex patterns. Exciting stuff! Looks great so far and looking forward to seeing more! I have added the tie and front of the jacket. 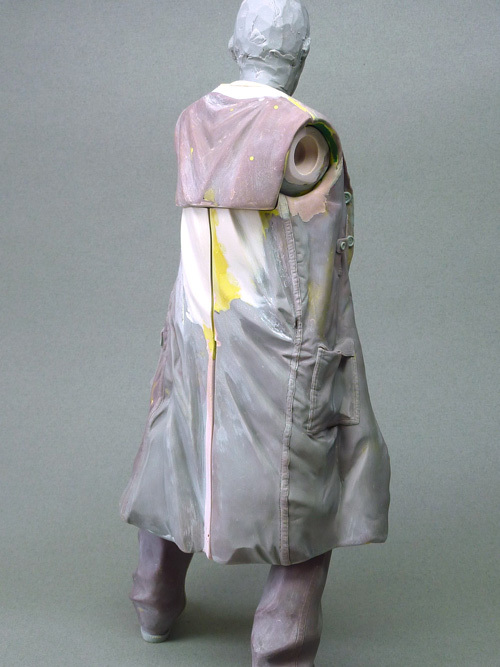 I decided not to sculpt all of the jacket as this will eventually be hidden by the trench coat, both the tie and jacket fronts have been sculpted as separate pieces. 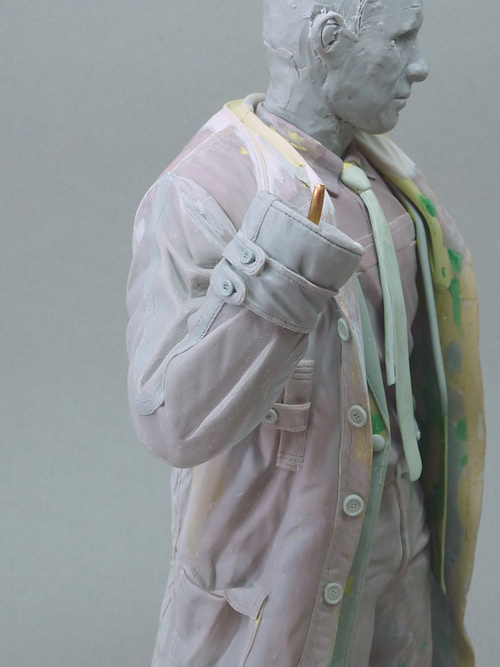 Apologies if my colourful mix of sculpting materials is detracting slightly from the details, I tend to use a range of different epoxies and clays depending on their different mechanical qualities and suitability for each particular part. 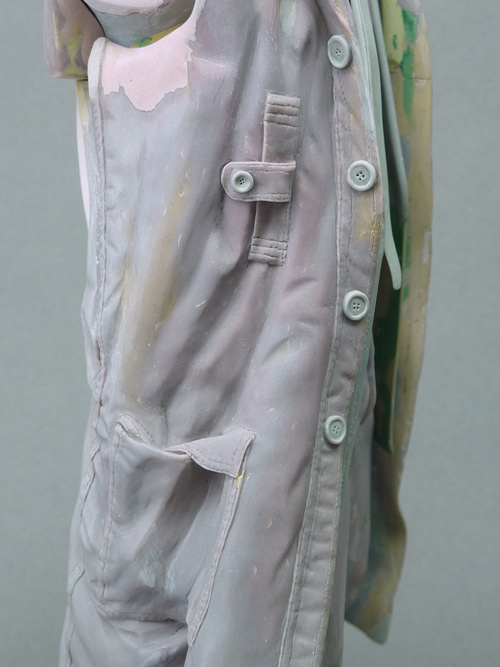 Work on the trench coat is underway so hopefully some more pics soon. Looking great. I think the head may be slightly oversized. I would scale it down a bit. Yep, head is a little oversized. I'll work back into it, reducing the size, when I gather the courage to tackle the likeness so it will scale better with the rest of the figure. I am definitely prevaricating though. Seeing your reluctance to start the head is easy to understand. 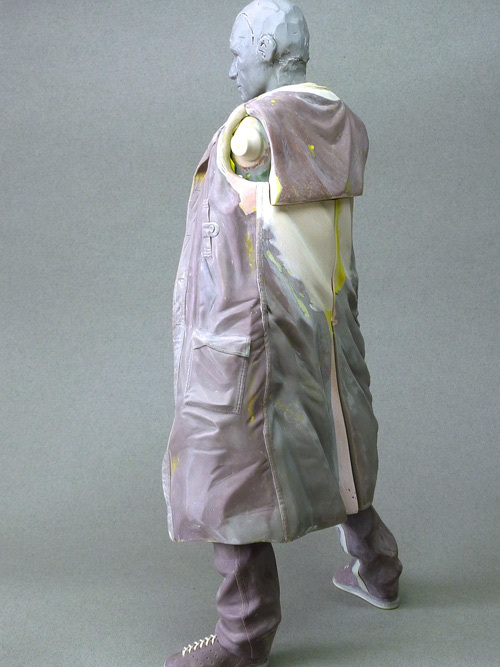 As far as I'm concerned, you're a fan of sculpting different kind of fabrics...and it shows Not easy to sculpt a wet coat, that's for sure! Keep up the great work and eager to see the next part. Thanks joberg. I found a great publicity still that has a Deckard in a partially rain soaked trench coat that inspired me to tackle the fabric of the coat in this way. Hopefully some paint will help with the illusion. What Bwood said ^ Seeing the degree of details on the clothes, I believe you've found trick and customizing tools to achieve said details. 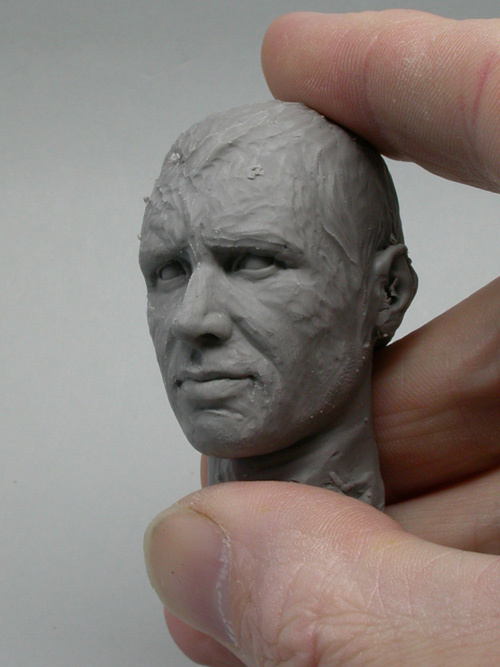 I'm sure you're familiar with such tricks as to look at your sculpt in a mirror, or putting upside down (helps to see what clicks and what doesn't). Keep up the great work and waiting for the next update! 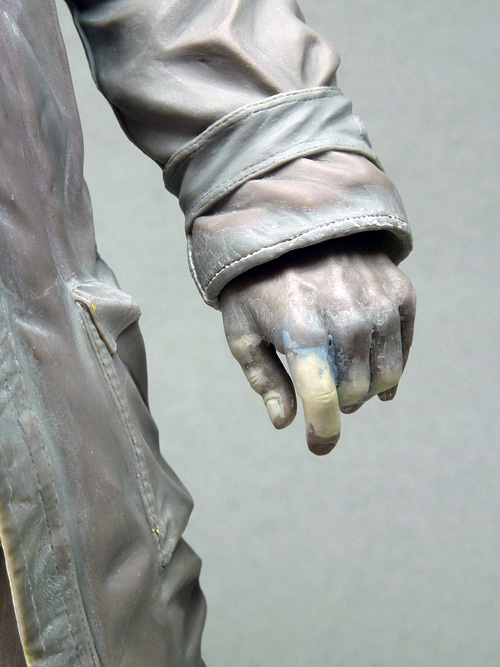 Really dynamic folds and expressive hand tinylight! Reminds me of a J.C. Leyendecker painting! Velvet Morning - Wow! Leyendecker is a new discovery for me, thank you! I'll certainly be studying those works from now on. 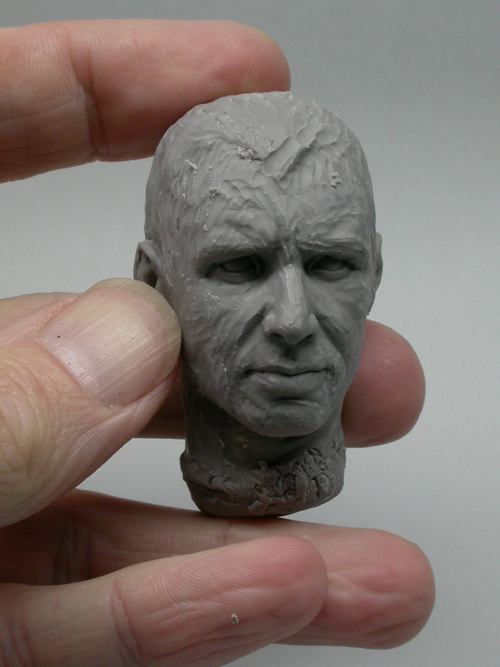 When I started this project I knew I wouldn't be able to sculpt Deckard without sculpting Mr Ford, something I have been pretty nervous about. 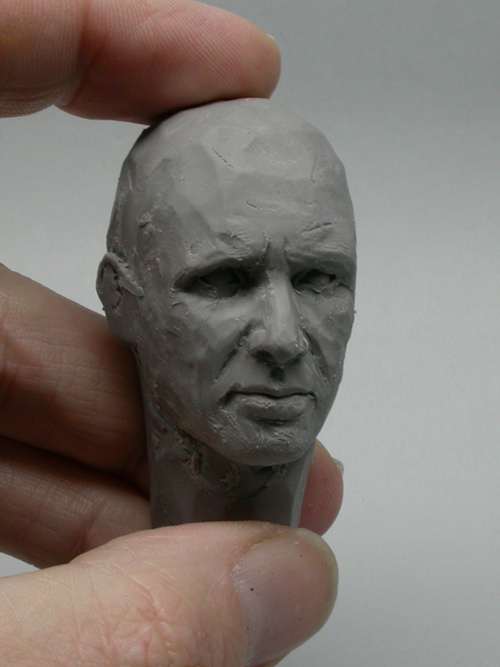 Creating any likeness is a challenge as the features are so familiar and any deviation from them is almost instantly obvious. 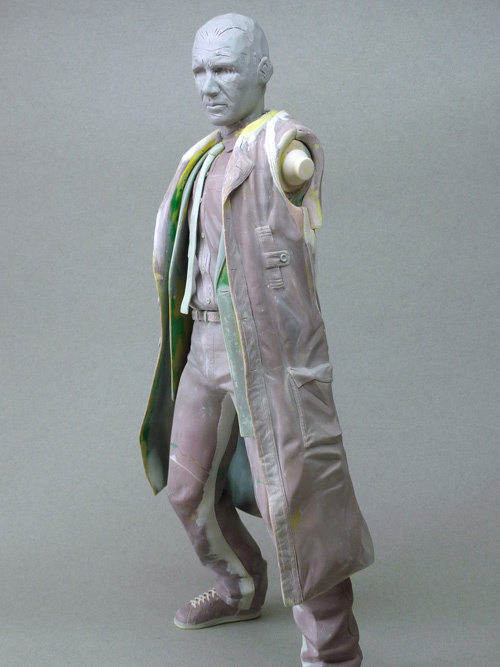 Having collected as much reference material together as possible and having a look at other sculptural interpretations of Ford I thought I would try and document my progress, not only as a record of my attempt but also to give myself 'another view' to help me through the process. I started to refine the face better describing the features. All the time I am checking photos and taking measurements to try and get the proportions of the face secured early on. I didn't want to go crazy on the details only to find I had to change them later on because I hadn't looked at my reference properly. 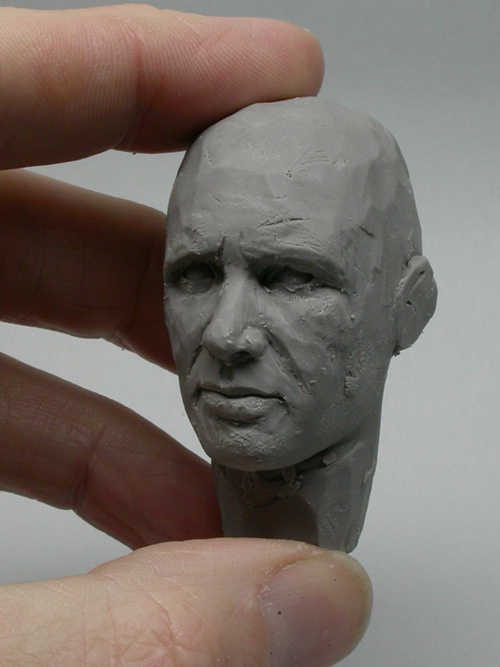 Further refining of the face. I am concentrating on the eyes and mouth more than the rest of the face at this point as these seem to be key elements of achieving the likeness. 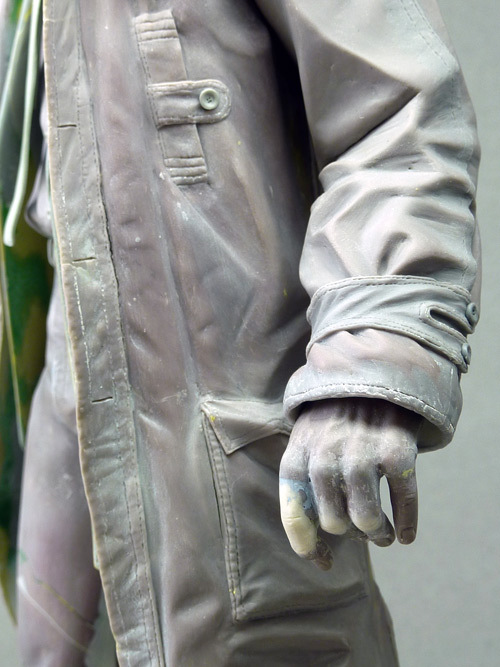 There is quite a few hours work here and frustratingly the likeness seems to shift between 'nearly there' and 'absolutely not' within the space of a few strokes of the sculpting tool. Returning to the piece after having a cup of tea is also yielding the same results. Ford's features are distinctive and yet subtle at the same time which is making them very hard to capture, resisting the urge to really start detailing one area over another is also very challenging. Just keeps getting better and better. Very fine job. 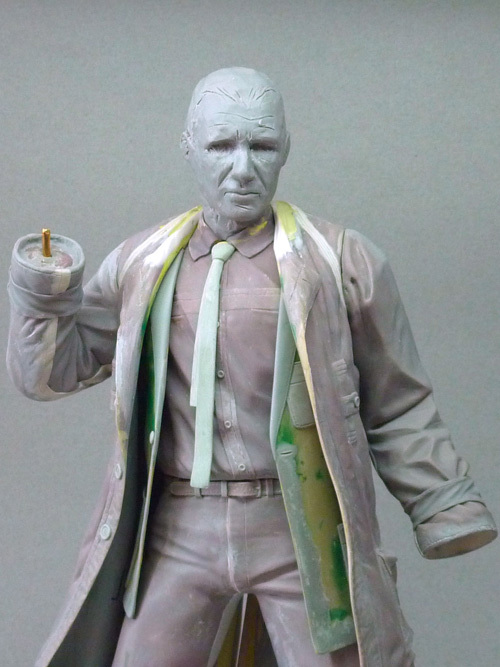 I just discovered this thread and have to say this is the best sculpt I've seen of Deckard EVER. I have some garage kits (M1, Barsom and a couple more) and your is hands down the most dynamic, natural looking and and accurate. 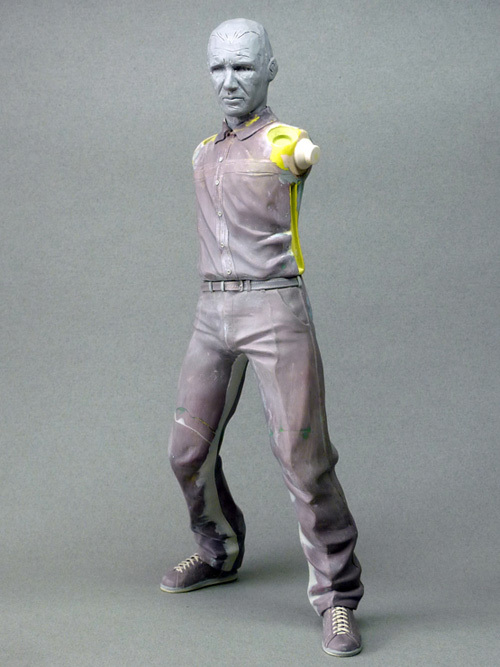 Seeing this I can only hope you consider making some copies available, and I'm out of words really with your sculpt, attention to details and skills. 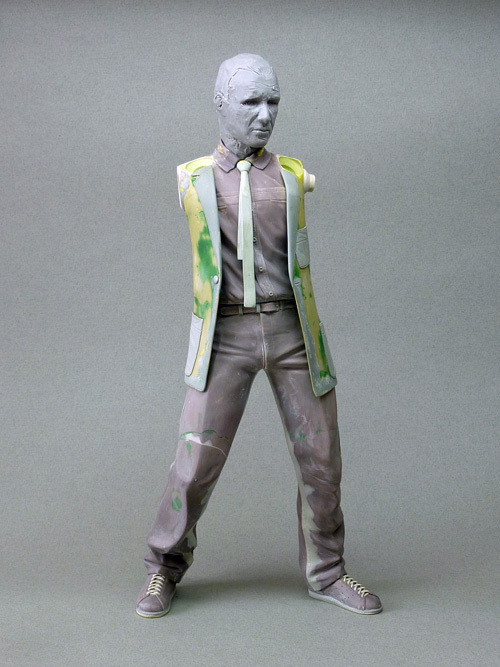 Please keep us updated in your progress, and please consider making a run of your amazing figure. It's certainly getting there...you're right, one stroke and it's right, or wrong. It really doesn't take much. Keep up the good work it's promising!